Cross between half-Goliaths and Humans (originally Farfs). The golons live side by side with the humans. They have a greyish skin with pink-coloured birthmarks covering some parts of their body. They are a bit taller than humans and have a tendency, inherited from their bigger ancestors, to build hard and highly beneficial muscle. Golons see themselves intact with the other humanoid races. Having a lot in common with the humans, the Golons are highly accepted by the Whiteskin for their strength in crafting and praised for their loyalty. Golons tend to circulate well in also Farf communities, due to their patience and stubbornness in decisions. Overall they make a civilised alternative to their more monstrous ancestors. On the other hand, there exists a tension between the Golons and their ancestor-race. 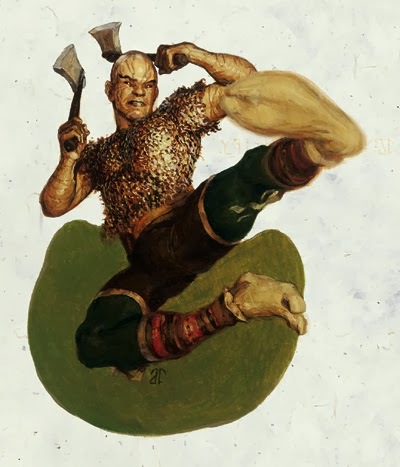 The Golons are descendants from the Farf tribe, which welcomed abandoned Goliaths. This naturally resulted in a unwelcoming of Golons unlike other races. Although the fact is highly frowned by the traditional Goliaths, the genetic problematic usually remain unmentioned while trading with the Golons. In worst cases, the Golons are even claimed to be part Orkin. Raised together with the Farf-race, the Golons has benefitted from a structured mind of the Farf and the hunter-gatherer Goliath race. The Golons has kept the muscular body of the Goliath, but inherited the more rational mind of the human, which has been reinforced human culture.